There are several design features of interior plantation shutters that you can choose from to achieve the exact look and feel you desire for your home. We've included a few photos and a little bit of information about each decision to help you along the way. 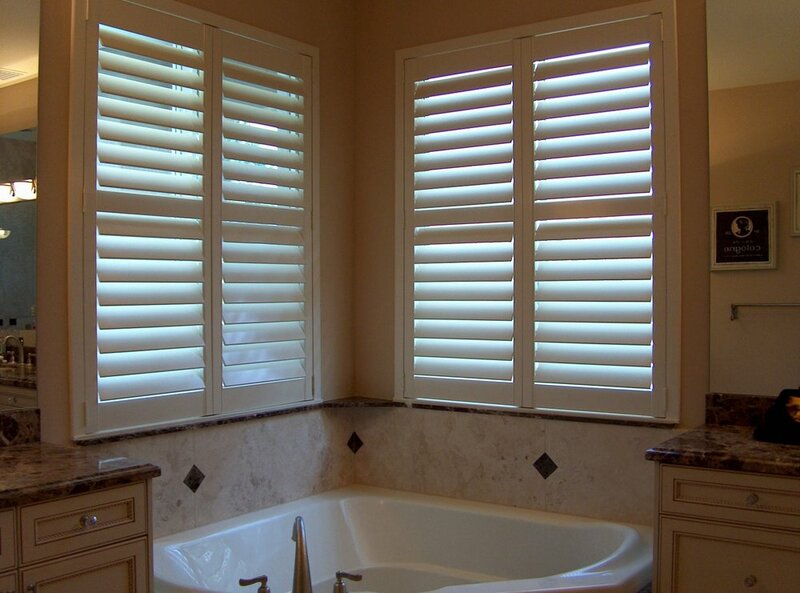 We manufacture shutters out of two different types of material, each with its own benefits. Our most popular product is our poly shutter, which is made out of 100% solid extruded poly resin. The poly material is so popular because it is impervious to moisture and humidity, meaning regular maintenance with a damp rag or mild household cleaner will not cause any damage to the shutter. 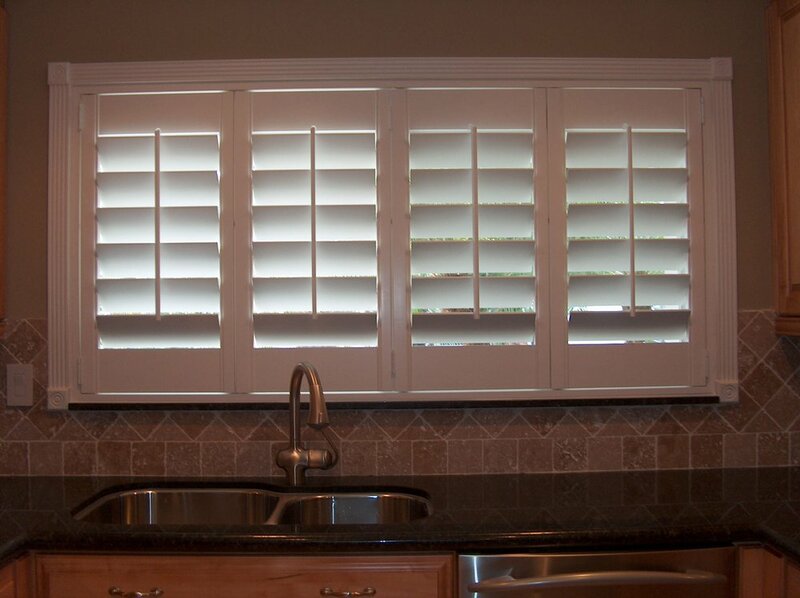 We also manufacture shutters out of solid basswood. Although less popular than the poly, the basswood shutter's main attraction is our ability to paint or stain the shutter any color you wish. 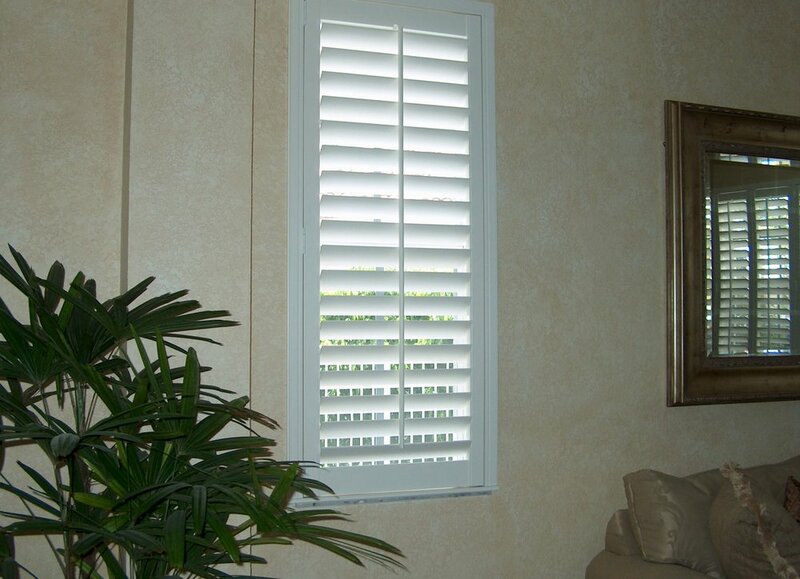 Unfortunately, the poly shutter is only available in two colors: white or off-white, so if a customer is adamant about a color outside of white or off-white, our only choice is a natural wood shutter. Both our poly and wood shutters are of the highest quality in the industry, and unless you are highly trained in window treatments, you won't be able to tell the difference between the two products. The decision that arguably impacts the look and feel of your window treatments the most is the size of the louver slats. The louver slats are the main horizontal component of the shutter that open and close on a daily basis. 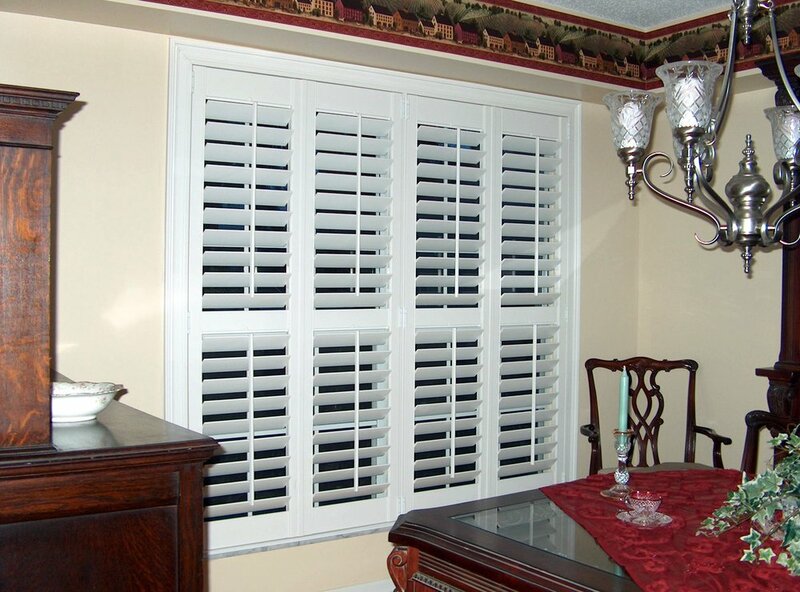 In both wood and poly shutters we have three different louver sizes: 2 1/2", 3 1/2", and 4 1/2". Many customers ask which louver size we recommend, and our response is always the same--it's honestly an extremely subjective decision. All three louver sizes allow in and block out the same amount of light (about 85% blackout), and all three louver sizes allow for the same amount of privacy (100% privacy when closed). The only real difference between the three sizes is the view when the louvers are in their fully opened position. The larger the louver size, the wider the space between each louver can be, meaning that you have a marginally better "view" when the louvers are open as you move larger in louver size; however, your eye does train itself to look right through even a 2 1/2" louver with little to no trouble at all. With respect to our existing customers, nearly 70% of our customers choose the 3 1/2" louver size, and the most common reason is that it's a nice compromise between something that they feel is too large--the 4 1/2" louver--and too small--the 2 1/2" louver. Over the past year or so, we have seen a movement, especially in those areas with more modern design tendencies, towards the larger 4 1/2" louver. Many designers we work with feel the larger louver is a more "clean" look that meshes better with modern design elements. The 2 1/2" louver, on the other hand, tends to have a very traditional look to it, and along with homes that enjoy that older more established feel, the 2 1/2" louver does very well in the Florida Keys and the Caribbean because of the island-y feel to it. After deciding on a louver size, it's time to decide how those louvers will operate. There are two different styles for controlling the opening and closing of the louver slats: standard front-tilt bar or upgraded aluminum rear control rod. The standard front-tilt bar is the traditional look on the plantation shutter that remains one of the most attractive window treatments money can buy. Over 75% of our customers choose this method for controlling the opening and closing the louver slats, and the best part is that the front-tilt bar comes standard on every plantation shutter we sell. The second option available to all customers is the rear control rod. The rear control rod eliminates the front tilt bar from the shutter, giving the shutter, and by extension your home, a more modern look with "cleaner" lines. Other than aesthetics, there is no significant difference to the two louver control systems. If you are more interested in the rear controlled louver slats, you have one additional option to split the louvers into two sections. The design of the rear control mechanism is such that we can split the louvers into two sections--giving you all the flexibility associated with a divider rail--without having the stationary rail that breaks the shutters into two sections. Amongst our customers, the split control option is more popular than the divider rail; however, both options will still make for a beautiful addition to your home. The final decision on the design of your interior shutters is the mounting style and frame used to secure your shutters in front of your windows. There are two mounting styles, inside mount and outside mount. Often times, the window's construction makes this decision for us, with the biggest factor in determining inside mount versus outside mount being the amount of recess you have from the face of the drywall in your room back to the window in your opening. 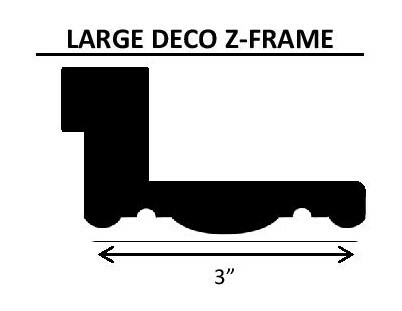 For any outside mounted shutter, we only have one frame option, what we call an L-frame. The L-frame is used to mount the shutter on the face of flat surface, and projects the shutter out into your room the required amount so that the louver slats will open and close without obstruction. An inside mounted shutter, on the other hand, gives us several options for the frame type we can choose. If your window has the required amount of recess for an inside mounted installation, and you also have your own molding already in place around the window, we use the same L-frame as an outside mounted installation but place the shutter inside the recess of your opening. The shutter is installed flush wish the front of your molding, giving the impression that the shutter and molding are one seamless window treatment. 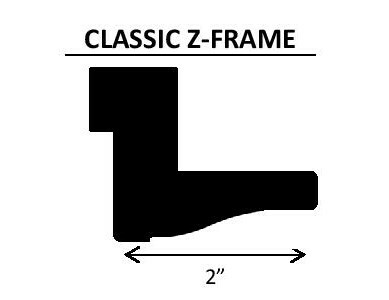 If you have enough recess for an inside mounted installation, and you do not have any pre-existing molding surrounding your window, we suggest using what we call a Z-frame, which incorporates a molding around your opening as part of the shutter system that we install. This is by far our most popular installation method and frame choice.